As popular as bariatric surgery has become  each year, more than 200,000 people undergo stomach-shrinking procedures in an effort to lose weight  the reality is that there is still little information about which patients should be getting the surgeries or how effective they really are as a treatment for obesity. That may change with BOLD, the Bariatric Outcomes Longitudinal Database, the first repository of patient information and outcomes related to bariatric surgery  procedures that include gastric bypass, in which the bulk of the stomach is tied off and food is rerouted directly to the bottom half of the intestine, and gastric banding, in which the stomach is simply squeezed into a smaller size with a rubber-band-like device. In the first phase of results released by BOLD at the annual meeting of the American Society for Metabolic and Bariatric Surgery , researchers reported safety data indicating that bariatric surgery is no riskier than other common abdominal and GI procedures, with an overall mortality risk within 90 days of 0.112%. Complication rates from bariatric procedures also put them in line with other common surgeries, such as hip replacements and gall bladder operations. “The clear message is that the very low mortality signals a high degree of safety compared to conventional thinking, particularly among the public, about the risks of bariatric surgery,” says Eric DeMaria, vice chair of the department of surgery at Duke University, who presented the data. The data support what other studies have been documenting in recent years  that although bariatric surgery, like any surgery, is invasive and risky, it’s becoming safer. In 2004, a study in the Journal of the American Medical Association found that the risk of death from gastric bypass was 0.5% , and a government analysis revealed that complication rates, particularly infections, from bariatric surgery had declined 21% between 2002 and 2006. That’s due in large part to a set of self-imposed safety standards that the ASMBS created several years ago. The society generated criteria for safety and quality of care, and invited all bariatric centers to meet them. Once centers met the standards  which include providing state-of-the-art equipment for operations as well as protocols for following up and measuring the outcomes of the surgeries  the centers were subjected to a site inspection. Upon passing, they earned certification as an ASMBS Center of Excellence. Patient data from those centers make up BOLD. 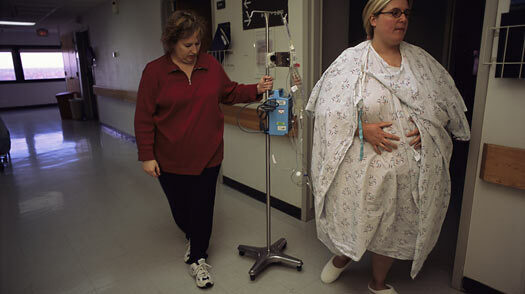 In the initial study, data from more than 57,000 patients undergoing bariatric surgery in 371 hospitals were included. In coming years, says DeMaria, researchers hope to mine the database for better information on the effectiveness of bariatric surgery in addressing weight loss and reducing the risk of other health problems, such as heart attack, stroke and diabetes, that are associated with excessive weight gain. So far, several studies have documented the benefits of surgery. In a 2007 trial published in the New England Journal of Medicine, researchers found that obese patients undergoing gastric bypass reduced their risk of death over a period of seven years by 40% and cut their chance of heart disease over the same time period by 56%, compared with people who did not have the surgery. That study was a retrospective analysis of surgery outcomes, however, meaning that doctors could not be sure whether other medical issues may have influenced the study’s results. BOLD would allow doctors to study patients electing to have surgery from the outset, giving researchers the opportunity to measure and analyze any factors that could affect health at all points before and after bariatric procedures. “The database collection is powered to address both the short- and long-term issues related to bariatric surgery, including things such as weight loss, improvement in health parameters like diabetes, hypertension, sleep apnea and cholesterol problems,” says DeMaria. With the ranks of overweight and obese people growing each year, that would certainly be welcome information for anyone contemplating surgery as part of a weight-loss program.